Clarification: California’s coastline (840 miles) is shorter than the end-to-end length of SF’s on-street parking spaces alone (900 miles). This post originally compared it to the length of SF’s total public parking supply (1,451 miles long), which is actually longer than the United States’ west coast from Mexico to Canada (1,360 miles). Here’s a point of fact for those naysayers who insist that SF absolutely needs every single one of its car parking spaces, and can’t spare any for safer or more efficient streets: San Francisco has 441,950 publicly-accessible car parking spaces. Of that, the 275,450 on-street parking spaces alone are enough to parallel-park a line of cars 60 miles longer than California’s entire 840-mile coastline, as the SFMTA pointed out to the SF Examiner today. That’s enough parking to fill parking lots that would cover the Presidio, Golden Gate Park, and Lake Merced. 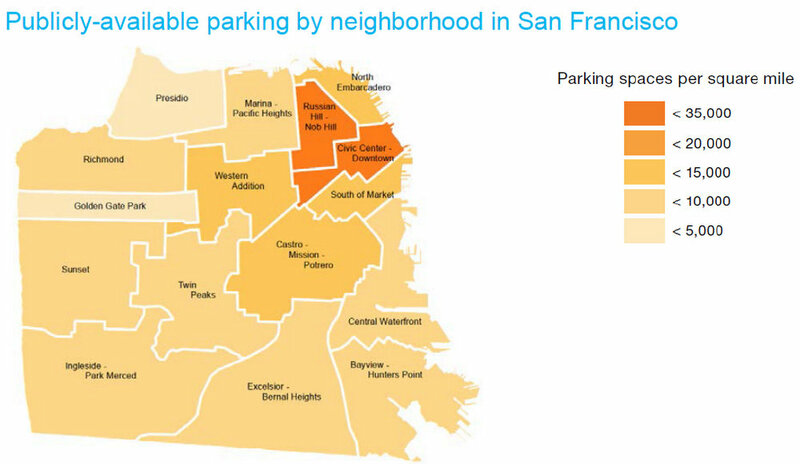 The figures come from SFMTA’s newly-updated parking census. The census is a manual count conducted to refine the agency’s 2010 estimate, which was based on a random sample of 30 percent of city streets. Parking spaces are most heavily concentrated in dense downtown areas, with 35,000 parking spots per square mile in areas like downtown, Civic Center, Russian Hill, and Nob Hill. On the lower end, most neighborhoods have about 10,000. None of the counts included private parking spaces in residential garages, which are estimated to be in the hundreds of thousands. “…With almost 10,000 vehicles registered per square mile, San Francisco today has one of the densest concentrations of cars on the planet, more than any peer city in the United States,” wrote SF State University Geography Professor Jason Henderson in an SF Bay Guardian column this month. The vast majority of curb space in San Francisco is devoted to 275,450 spaces for car storage. Each of those takes up roughly 140 square feet of real estate, 17 to 20 feet long and about 7 feet wide, according to the census. Ninety percent of those spaces are unmetered, and free to use at all times of day. Bruce Osterweil, a car-owning Richmond resident, pointed out the absurdity of the free parking situation to SFMTA Director Ed Reiskin during a community meeting yesterday, after city officials had explained their proposed transportation funding ballot measures. Osterweil argued that putting a more rational price on parking, by expanding parking metering and permit restrictions, would reduce parking demand — thereby opening up parking spaces and reducing traffic from cars circling for parking, all while raising money to improve transportation options. That’s the rationale behind the SFMTA’s SFpark program, for which the parking census was conducted. SFpark is in a transitional phase as its two-year pilot period ends, and the agency is no longer using the in-ground sensors that were used to collect parking usage data. The SFMTA expects to present its SFpark pilot evaluation next month. SFMTA Director Reiskin said nothing in response to Osterweil’s comments, but after the meeting he told Streetsblog that the agency is essentially “institutionalizing” SFpark’s principles into the agency’s general parking management program. SFpark has been moved from the Finance Division to the Sustainable Streets Division, he said. And instead of using sensors, the SFMTA is now monitoring parking occupancy by using smart meters that track payments. Still, the SFMTA isn’t quite ready to try expanding parking meters again, after the backlash in Potrero Hill, Dogpatch, and the northeast Mission neighborhoods. “There were things done under the SFpark banner that hit some walls, but the general concepts, I think, have been fairly well validated empirically,” said Reiskin. But avoiding a car-clogged future for San Francisco will ultimately require recognizing that there’s an upper limit to the number of cars that can safely and reasonably fit onto a 7-by-7-mile peninsula. Studies show that when more parking is built — and underpriced — then more residents tend to own and drive cars. Yet as we’ve written, the more space we devote to parking, the less space we’ll have to house people — and SF is poised to build another 92,000 spots for personal car storage by 2040 under current policies. Meanwhile, attempts by the SFMTA to take even a sliver of curbside parking for protected bike lanes or transit bulb-outs invariably result in merchants and residents fighting tooth and nail to preserve every last spot. And SF’s political leadership rarely steps up to defend such rational efforts to more efficiently re-purpose public space. I like that the Golden gate park is used as an example because in the weekends the park already feels like a big parking lot with cars everywhere. For me coming from the Netherlands it is very difficult to understand why there are cars at all in the park. That some people like to go to the park with there car is sad but understandable, but driving into the park and parking there? To me a park is a place to escape form the city and its cars for a while to walk and bike without worrying about traffic. Did they count all the double parking spots correctly? Part of the explanation is that the park was developed to some extent as a network of carriageways for pleasure-cruising in horse-drawn carts. So when the age of automobiles came around, there were already rights of way for large, wheeled traffic. The rest of the story mostly has to do with our tendency to accommodate cars in every area possible, even where impractical or outright destructive. It makes no sense. I do wonder about the methodology and how much space cars need to park vs. how many spaces there are practically considered drivers parking diagonally across 2-3 perpendicular spots. The pro-free parking backlash comes from the same nativist roots as the anti-tech backlash. Middle-class people who moved here many years ago are more likely to own a car, because back when they moved here it was still convenient and affordable to own a car, and people are loathe to give up a convenience they have become accustomed to. Middle-class people who move here now (i.e. most tech workers) are less likely to own a car because it’s no longer convenient or affordable; more likely they will ride a bike and use Uber/Lyft to get around. So for some people, drivers vs. cyclists is just another shorthand for real San Franciscans vs. Techies, Us vs. Them. The typical working class San Franciscan rides Muni, of course – the lie that free parking makes SF more affordable for those who are most disadvantaged is just that. The pro-free parking backlash is about an established middle-class shoring up their privilege as driving becomes a more expensive and less practical option, and resisting the loss of status that would come with abandoning their cars and relying on Muni. Let’s let the voters decide. Maybe when the ballot measures fail (or the VLF fails to get on the ballot thanks to the mayor) the SFMTA will be forced to turn to Sunday meters and installing more meters to help raise money and reduce car congestion. What I bet they did not count is all the on-street parking spaces effectively created when people block their own driveway or garage with an additional car. A two-car family with one garage or driveway parking space can park the second car on the street blocking that driveway. That results in a doubling of available parking. Modulo the typical use case where the family uses the curb cut to use as a privatized public space so they have guaranteed parking, and use their garage as storage for stuff. I predict it is more likely that MUNI just ends up melting down. A sad result but great for those who can bicycle. I was shocked to learn that, until the 1970s, a major auto roadway ran directly under the Rijksmuseum (today, it is a bike-only pathway under a grand archway) and straight thru the now-grassy commons. It’s hard to imagine this today, considering how well-loved the pedestrian-only area is now. So you see, the reality is much more depressing than GGP’s wide roadways being a simple artifact of history. No, it’s really an artifact of our ignorance and of our city’s leaders’ continued failure to have any forward-thinking vision. California. Time to limit number of cars per household and their speed. Thank you, Aaron and Streetsblog, for your advocacy and pointing out how insidious our parking policies are. Our future looks promising with the expected delivery of 92,000 more parking spaces. Just what San Francisco sorely needs, more cars and more parking. There was a huge battle over this in the ’90’s; basically the answer is that the rich people who run the museums see the park as a big parking lot, and they spend the money defending it. You can’t buy taste. They really should put a dollar figure on this. I would guess $100/sf would be about right; that makes about $3.9B in real estate being occupied almost rent-free. What makes you think this is “typical” beyond seeing some number of examples? I certainly see many people pulling their cars into their garages. I have no way of knowing which is more common. But then the city would be nickel and dimming drivers. The SFMTA has plenty of money, they just proved it by giving back some of the car money they’d stolen. If there is $9,600,000 for parking they didn’t need fot Muni there’s plenty more than can cut from Muni before making us poor, picked on drivers pay anything. Why should youth get free Muni passes? That’s money that could be spent letting them park for free. You win. Beer’s on me. Fortunately the city already has set a price. The annual cost of a parklet is $221 for 2 spaces (above the $1000 inspection / permit and an additional $650 to remove the meters). 2 spaces is 34 – 40 ft by 7. Take the midpoint and it’s 37 x 7 = 250 sq ft so you’re leasing it for a bit less than $1 / sq ft / year. This strikes me as pretty low. There are two different methods for calculating the length of the coastline. According to the National Oceanic and Atmospheric Administration, the California coastline is 3,427 miles long, or more than double the maximum distance cited for SF parking. Lies, damned lies and statistics, right? It’s also a great example of how what the Netherlands has today has been consciously created out of an earlier much more autocentric past. Thus negating the “well that’s nice for the Netherlands but that’s Europe” argument (btw it’s not even the fact that it’s Europe…most European countries’ bike infrastructure pales in comparison to that in the Netherlands). 1960s-era stretch through central Amsterdam separating formerly connecting residential streets, prioritizing long straightaways for cars with freeway-like guardrails, etc. I propose a big installation piece at the De Young: parklets in every roadside spot and every auto entrance blocked with a sculpture. An extended run installation for one year. It’s Art! Who’s in? The factoid that bothered me the most was that 90% of the street parking was free and meter-less. I don’t know what the right ratio is, but that sounds pretty off to me. So, the parking spaces in San Francisco would only form an unbroken line of cars from the Oregon border to San Diego *inland*, rather than following every curve of the coast… yeah, that’s still a huge number of parking spaces. Unlike the BS that is below, parking is made available so that everyone can enjoy the park. Not just the anti-car people. Disabled people and seniors who can’t walk far can enjoy many places in the park that they would not otherwise be able to. I can see why you don’t understand since you come from the Netherlands where they don’t care as much about the more physically challenged people since wide sidewalks and curb ramps are not common like we have here in San Francisco. The Netherlands are not the utopia that people make it to be here. In any case disabled people and seniors who need to use vehicles have many options–not the least of which is the free Golden Gate Park shuttle. Sorry, Streetblog has usually interesting materials, but this sort of comparison is pointless and diminishes the overall credibility of the site. These silly analogies are bad science and totally uncalled for. It is like bizarre comparisons like “if the Golden Gate cables were aligned on a straight line they would cover between San Francisco and (syz)”. Length of coastline has nothing to do with the density of street parking in San Francisco. 3) Transit options to the park isn’t really great, especially at weekends. Id give up all that parking, for just a little bit more. So we should not allow people who can’t even use motorized wheelchairs in the park? Wow, talk about discrimination. To merchants, customers who driver are also customers too. What you are saying is customers who drive should not be allowed on Columbus or Polk Sts. Even more discrimination. If you relatively low figures for the size of a parking space, 175 square feet on street and 350 feet off, the public parking spaces are occupying 2,444 acres. Let’s round down to 2,000 for easy math, to allow for unusable locations etc.. At 50 units per acre, which is lower than the density of most new San Francisco buildings, that’s enough land for the construction of 100,000 housing units. I bet an initiative for free steak, free beer and free pot would win handily as well. Well, they did. Your Prop L went down in flames. The ultimate problem with charging and fees for on-street parking is EVERYONE ALREADY PAYS for it through a multitude of taxes. Only if they live in the city. Otherwise, commuters and tourists get charged the same as city residents.